A pop culture icon, if there ever was one. 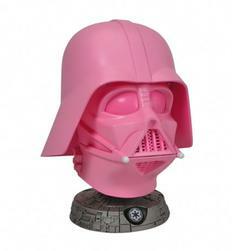 The classic Darth Vader helmet gets an overhaul, and a new PINK paint job for a very important cause. Gentle Giant Ltd. donated 10% of the retail sales price to Susan G. Komen for the Cure® with a minimum guaranteed donation of $5,000, in support of Komen's promise to save lives and end breast cancer forever.